The Steam Ship Freshspring is the only surviving example of the 14 Fresh class water carriers built by Lytham Shipbuilding and Engineering Co for the Royal Fleet Auxiliary (RFA). SS Freshspring was launched on the 15th August 1946 and after trials in February 1947, she sailed to her long term base in Malta. Initially coal fired she was converted to run on heavy fuel oil in 1956 whilst in Malta with three burners, one in each of the coal furnaces. 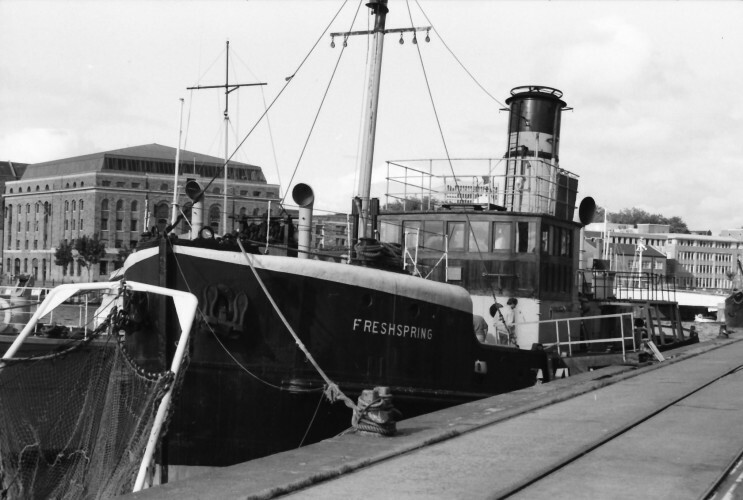 She returned to the UK in 1967 to replace a sister ship, Freshpond, at Devonport. Prior to being put into reserve in 1976 at Gareloch, she also worked in and around the Clyde and Pembroke docks and she was surveyed and refitted at Ardrossan in 1969. She was offered for sale in 1977 and sold two years later to a private owner who towed her to Bristol, which is where she was last steamed. After problems in Bristol with thefts including much of the wheelhouse equipment, she was then moved to Newnham on Severn. If you have any pictures, stories or other information about Freshspring or other vessels of the Fresh class please do not hesitate to contact us.